Time consuming but a real keepsake when it is done! A very dear friend taught me how to make these and we made them together in Singapore. Not only are they beautiful keepsakes and prettier than anything you could buy in a store, they always remind me of her. She is faithfully serving the Lord in Asia after surviving a bout with Malaria one Christmas. 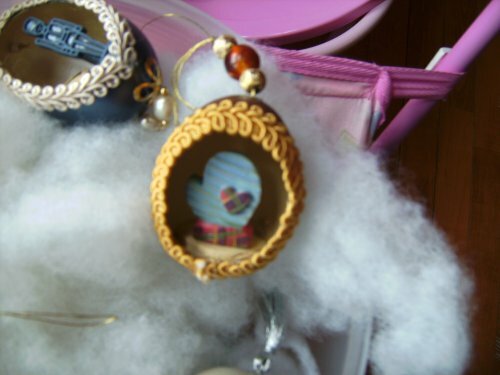 They are wonderful keepsakes because you can make them personal for anyone... a pair of ballet shoes for a daughter, a toy drum and soldier for a son, etc. I have about 10 of them and cherish them all. 1. Choose good eggs! Shine a flashlight through your chicken eggs to see if it has any 'weak' spots where the shell looks thin and try to choose an egg that has a good hard shell. Make a tiny hole with embroidery scissors into the egg's front side (not the top or bottom) trying not to let it crack all the way around. I peck at it like a chick would for best results! Use the tiny scissors to cut the hole into about a 1 inch opening in the front of the egg. Let the egg insides come out for an omelet later! Rinse out the inside of the egg and let it dry out. 2. Begin painting the egg with some thinned Elmer's glue (glue with a little water added to it to make it thinner). Use a paint brush for this and paint a coat on the outside. Let it dry. Repeat until it has about 3 layers. (I put it on top of a chopstick stuck in a jar so it can dry faster.) Then begin doing the inside of the egg. 3 layers on the inside is good, too. Keep the glue thin enough that it doesn't get gloppy in any spot and be sure to let it dry between layers. This makes the shell stronger. 3. When it is totally dry, cut the 1 inch hole into a nice oval shape...big enough to see inside the egg. 4. Choose your colors and theme! 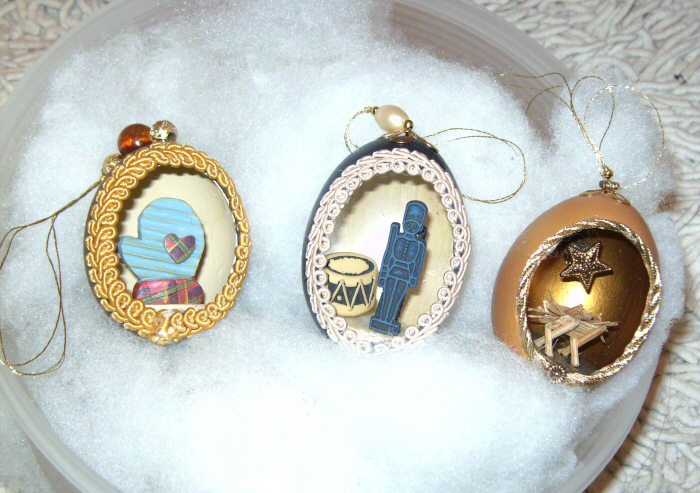 The inside of the egg can have a Christmas motif or can represent your child's sport or hobby. Decide what color the outside should be, what color the inside should be, and what kind of trinket you plan to put inside, trying to keep it color coordinated. The photos show some of mine. The 'trinket' can be anything...a mini ornament from Hobby Lobby or Michaels (as in the mitten one you see) or a decorative button(s) (as in the one for a baby girl). 5. Paint the outside of the egg with craft paint. Paint as many coats as it needs to be a smooth good color. Let it dry (again on the chopstick). Paint the inside, again as many coats as it needs, letting it dry between coats. 6. Take your Styrofoam and cut a small circle that fits just right inside the egg on the bottom. Paint it the same color as the inside of your egg. 8. Put your thread into the needle. Pull your ends so they are perfectly even. 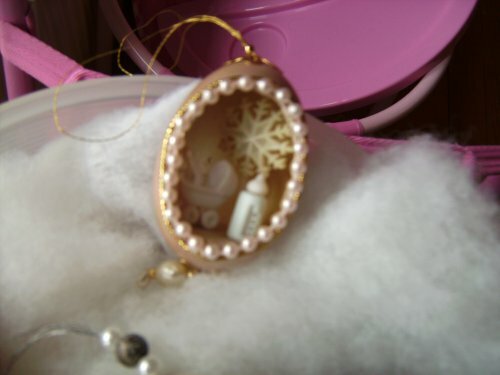 Going from the INSIDE of the egg, go thru the tiny hole, pulling your needle and thread to the outside top of the egg. Then, attach a bead (larger than the tiny hole you made) on the ends of your string so that it is placed on the INSIDE TOP of your egg, tie off your string. Make sure your loop is the appropriate size for hanging it on a tree. Make sure when you pull your loop now that the bead holds it tight inside the egg. Clip your string ends. You can now put any beads you want onto the loop and push them down to the egg. Repeat this with the bottom of the egg if you want beads there. It is not necessary to put a bead on the inside bottom b/c it will be covered by the trinket. But do tie a big enough knot to hold it any beaded string you want on the bottom. 9. Almost done! Hot glue the trinket to the Styrofoam base after you have placed it all inside the egg and decided how far back you want it, etc. Then hot glue the Styrofoam base inside the egg. 10. Glue (either with craft glue or a hot glue gun that doesn't drip and run) the trim around the edge of the cut out part of the egg to finish it off. Copyright © 2008 by Sara Campbell. All rights reserved.